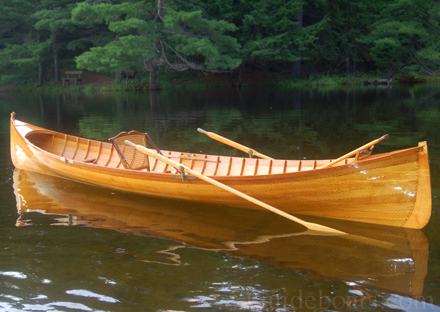 Among the construction techniques that are unique to the Adirondack Guideboat is the use of natural crooks. 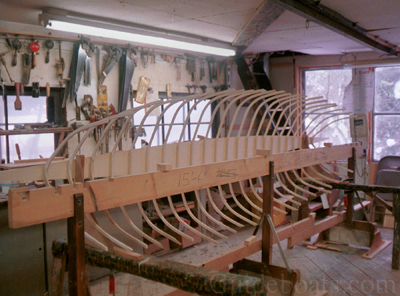 Gathered from Spruce roots, the ribs are sawn from these because the swell and turn of the root so closely approximates the curve of the boat's ribs. 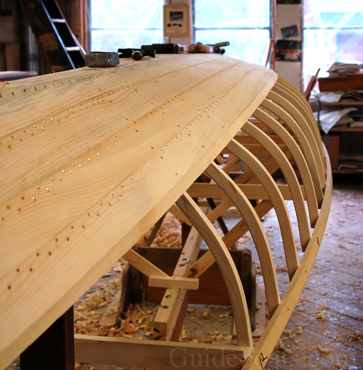 By Laying out the rib patterns, matching the curve of the grain with the curve of the rib, we achieve a stronger yet lighter skeleton framework for the Guideboat. Sawn ribs are also more stable and will hold their shape, which does away with the requirement to have internal cross-braces, or thwarts. Spruce has a strength to weight ratio greater than that of steel, meaning that for an equally-weighted piece, the spruce is stronger, yet remains flexible. 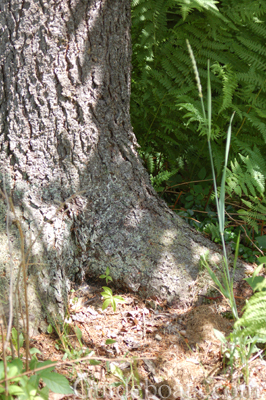 The stems are also sawn from root crooks. The Guideboat is built with a flat bottom board around 8 - 9" in width at the center, tapering to ½" at the stems in an elliptical shape. It is made from a piece of straight-grained clear White Pine, approximately ¾" x 9" x 14'. 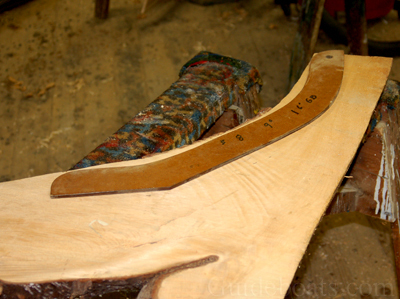 The edges are beveled to continue the rib line and to accept the planking. The ribs are sawn from the root crooks following a series of patterns. Each pattern corresponds with a section of the boat. 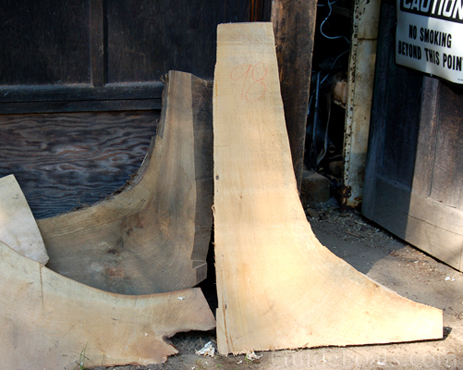 They are cut from the stock over-thick and sliced into pairs, thus matching the grain and tension. 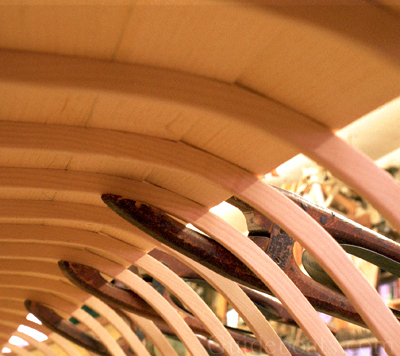 The ribs and stems are then sized and finish-sanded, ready to be mounted onto the bottom board. The ribs are then fastened onto the bottom board in pairs, with screws running thru the bottom board into the feet of the ribs. The stems are fastened to the ends of the bottom board in the same manner. The boat hull is built upside down on a strong back. This skeleton is first fastened upside down on to a strongback. The frame is leveled using crosspalls, and the stems are plumbed and checked for square. The frame is braced to the strongback. This is the only time that square, plumb and level are used; from this point on the boat is a series of complex curves that are best assessed by the human eye. A staylast is fastened in a fair, sweeping curve at the gunwale line. 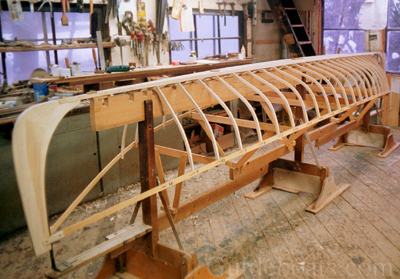 The frame in then faired and the bevels corrected before beginning planking. Planking commences from the bottom board to the sheer. The first plank to go on is the garboard. The bottom board bevel is corrected and faired, so as to extend the line of the rib over the bottom board. 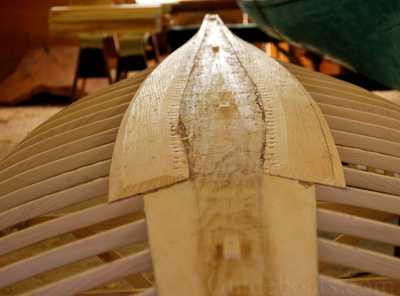 The garboard covers both the bottom board bevel and the rib. Each plank has a beveled lap, with the next over-laying plank having a corresponding bevel so that that the two planks lay flush, resulting in a smooth skin. 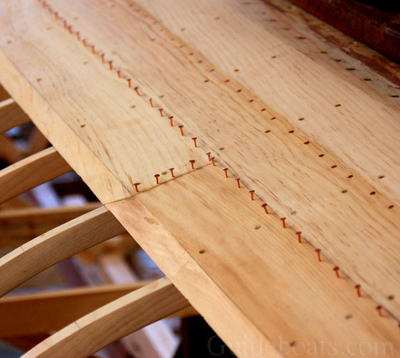 After the planks are fitted, they are screwed onto the ribs. The overlap is then tacked along its length. We proceed in this manner through the sheer plank. 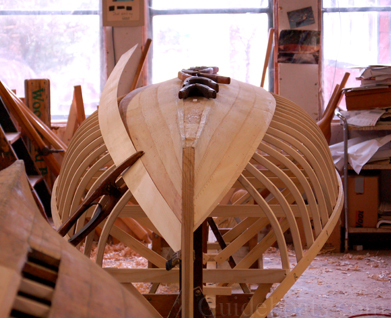 At the turn of the bilge, you have to compensate for the curve by hollowing out the planks. 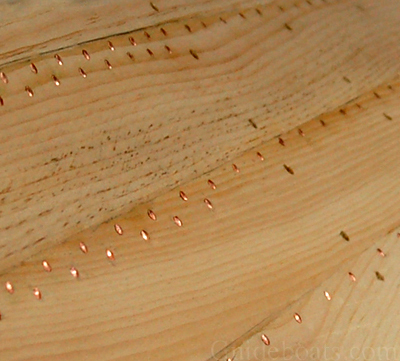 The seam is tacked along its length with small copper tacks that point through the planks by 1/16." In 1/4" thick planks this would be a 5/16" long tack. As the point sticks through, a clinching iron is held against the plank, causing the point to curl in a 'j' as the tack is struck with a hammer. This clinching process causes the tack to tighten the seam together, rendering the seam watertight. 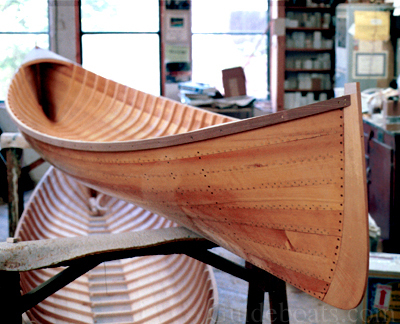 These seams are not glued together, rather it is the ability of the craftsman to make a wood-to-wood fit that is critical in making the boat watertight. A thin film of oil-based bedding compound, or thickened varnish is spread between the laps to help maintain a mating surface. These beveled laps are put on with the use of hand planes. As the plank curves in three directions, the bevel becomes compound, tapering from one end to the other. The planking proceeds in this fashion to the sheer plank. 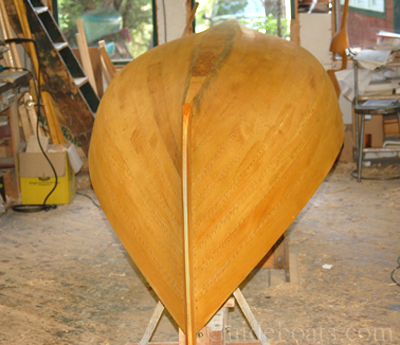 At this point the boat is faired, sanded and given a sealer coat of varnish. 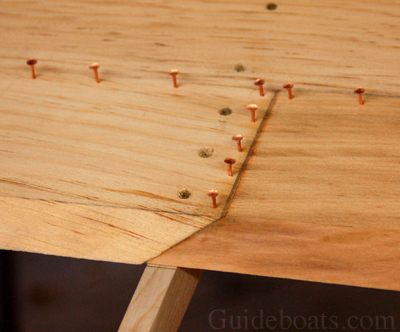 Deck beams are then fitted and the gunwales are notched to receive the decks. A deck cap then goes on to finish the decks. 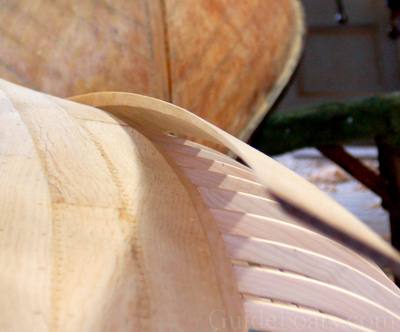 Seat frames are made up and woven with rattan cane. They get attached to cleats that are screwed to the ribs. 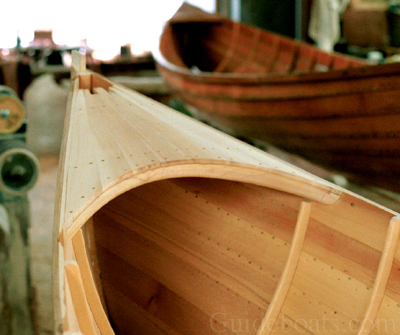 each boat has a fixed bow and stern seat, and a removable middle seat. The stern and middle seats each have a back rest. Cleats are pieces of wood, usually Cherry, that are screwed onto the ribs to support the seats and yoke. 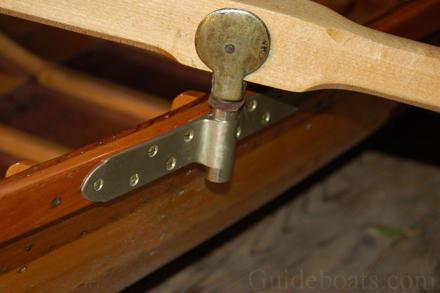 Specially cast bronze oar locks are screwed to the boat. There are two rowing stations, depending on how many people are in the boat. With one person you row from the middle seat. 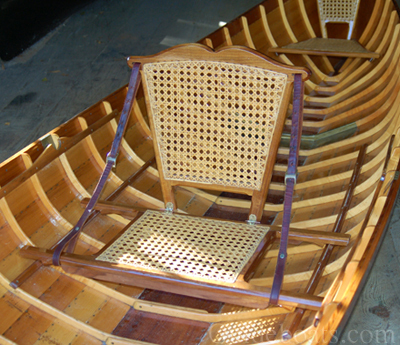 With two persons, the rower sits and rows from the bow with the passenger sitting in the stern seat, facing them. With three persons, or a large load, the rower has the choice of rowing from the middle or the bow, depending on how the boat trims the best. Stembands are attached to the stems, fore and aft. These are bronze and are there to protect the stems from injury from hitting objects in the water like logs, rocks, or docks. Oar lock horns are pinned to the oar. This allows the rower to let go of the oars if need be to land a fish or use their hands, without having to ship the oars (bring them inboard, place the oars inside the boat). The oars will just trail in the water along side the boat, which also helps it track. 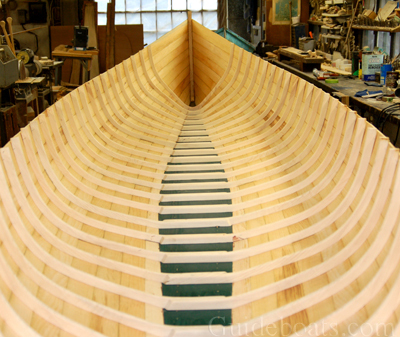 Oars are usually 7’6” - 8” for a 16’ boat. They are each made from a solid piece of Maple. 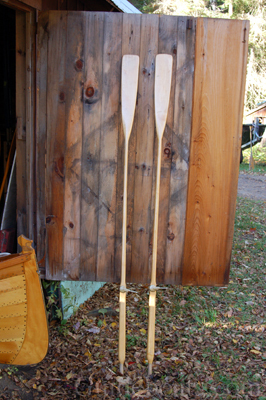 Spruce is sometimes used for shorter, lighter oars on smaller boats. 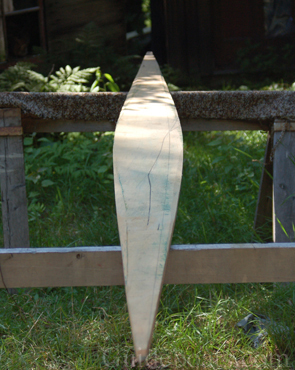 The sneak paddle is a solid piece of Cherry or Spruce. It is used by the passenger to help propel and steer the boat. 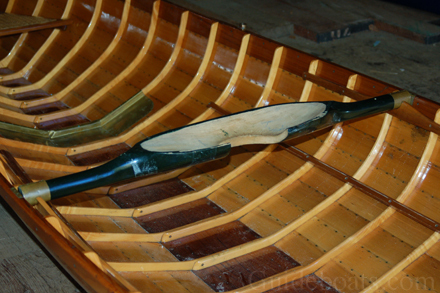 A paddle is also used in tight quarters where there is not enough room to swing an oar. Traditionally a paddle was used to sneak up on game without making any sound. The carry yoke is carved out of a solid block of Cedar. It is fashioned after the bucket yokes used to carry water, milk, or sap buckets. It is hollowed out to fit around your neck and shoulders. The arms fit into the U-shaped holders of the yoke cleat. It is placed in the boat, then the boat is flipped upside down onto your shoulders and back. The yoke is fitted such that the weight of the boat is transferred onto the large muscles of the back, not on the shoulders and neck, making for a comfortable and balanced load.